I'm happy to say that the deadline for my phantogram competition is now in the past, and I can stop begging for entries. I've compiled them for the judges, so before too long I'll be able to announce and exhibit the winners. In my laziness despite the self-imposed need to provide a weekly image, I sometimes just look around and see what presents itself, hence the garlic. 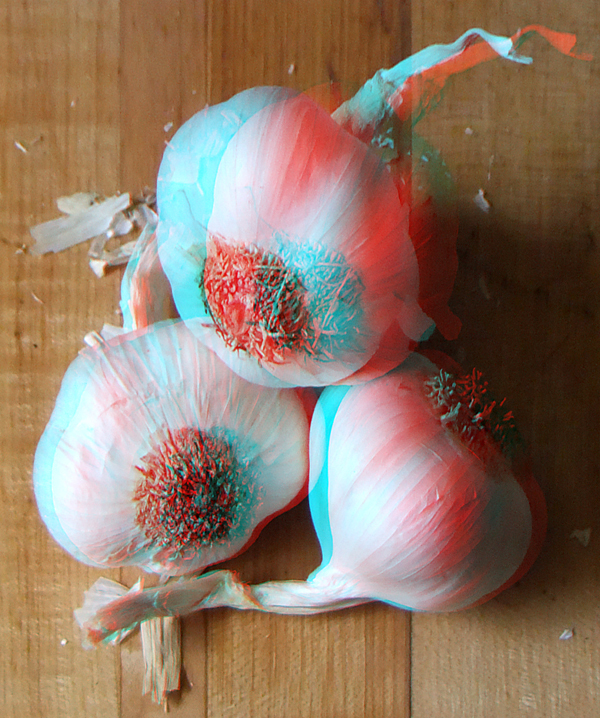 I love to cook with both garlic and onions, and tend to distrust dishes that don't contain either one. This is a simple shot using a butcher block surface as backdrop. It is a phantogram, and so I invite you to print it out so as to lay it down and view it properly. Better yet, it will look great on an iPad or other RGB viewing device.